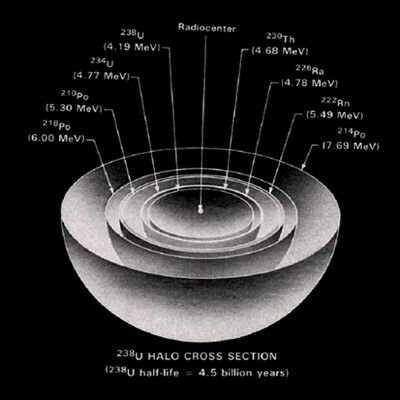 Irrefutable evidence not only of a young earth, but also of an instant creation are found in Polonium Halos. The evidence also contradicts the evolutionary theory of a ‘hot earth’ beginning, which cooled over hundreds of millions of years. These radiohalos are found inside granite, which are regarded as the oldest type of rock on earth. This type of rock is thought to have been processed and cooled over millions of years according to evolutionary theory, and have left their evidence inside these rocks. Polonium (Po – 84) is a chemical elements found on the period table. It is a rare and highly radioactive element found in many cases with uranium ore.
A piece of polonium in molten rock can be synonymous to dropping a tab of Alka-selzter into water. In the same way that gas bubbles from the alka-seltzer, so does the polonium atom emit radioactive particles. In a piece of molten rock, the ‘traces’ of the movements of the particles should have been dissipated as long as the rock is fluid (molten), the same way that the alka-seltzer bubble dissipate. If the water was to freeze however, the bubble traces would become trapped in the solidified water. 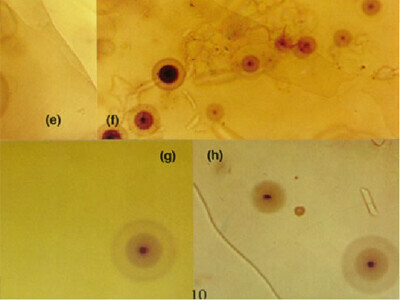 This is what we observe with the polonium halos, is instantly solidified traces of its radioactive particles. All around the world in exceeding great quantity do we observe this phenomenon, of radio polonium halos embedded in granite rock. This would seem to prove that the solid matter of the earth would had to have solidified at an instantaneous rate, or rather all primordial matter ‘froze’ (or was created instantaneously) into solid granite. All radioactive isotopes have to have a parent isotope that it came from, creating a precession of new isotopes, or daughter isotope, as time goes on and leave their behind evidence of their placement. Polonium only exists for roughly 2-3 sec, and in each case they are found, they had no parent isotope. This would show that the granite would had to have formed very quickly. Granite is the most abundant rock in the earth crust accounting for almost 60%. This is an additional problem for the Old Earth Theory, as molten as granite, when heated, cools and becomes become rhyolite. Samples and measurements of radiohalo samples taken from different geologic layers; Jurassic, Triassic, and Eocene formations in the Colorado plateau, each reveal the deposits were made within months of each other, not hundreds of millions of years. 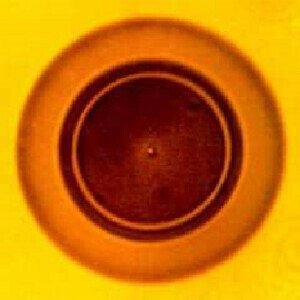 Orphaned polonium halos of polonium 218 have no evidence of a mother element which would imply an accelerated nuclear decay and rapid formation of associated local minerals. This evidence also points to an instantaneous creation. This primordial polonium found in deep crust granite layers, is known to have a very short lifespan. This is the decay sequence of each isotope found in the halos, and the evidence begins with polonium 218. In the examples found, no evidence of any earlier isotope was found, only the sequence form polonium 218 to lead 206. This chart shows the entire sequence for the of decay for Uranium 238, including half life. In order to form a polonium 218 halo, some Po-218 must have been decaying after the granite rock had already become solid. This Po only has a half life of 3 minutes, and must have been deposited before the rock was solid, yet where did it come from? It has no parent isotope, and has such a very short life! The only logical conclusion based on these scientific observations reveal that these rocks, deep in the crust of the earth, had been created instantaneously with the polonium inside of them. 2.) Gentry, R. V., Radioactive halos, Annual Review of Nuclear Science 23:347-362 (1973). 3.) Gentry, R. V. , W. H. Christie, D. H. Smith, J. F. Emery, S. A. Reynolds, R. Walker, S. S. Christy, and P. A. Gentry, Radiohalos in coalified wood: new evidence relating to time of uranium introduction and coalification, Science 194:315-318 (15 October 1976). 4.) Gentry, R. V., Radiohalos in a radiochronological and cosmological perspective, Science 184:62-66 (5 April 1974).